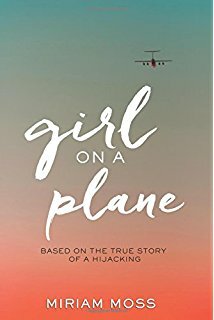 As the summer of 1970 draws to a close, Anna is set to fly back to England to start a new year at boarding school but her flight is hijacked by Palestinian guerillas. Forced to land in the Jordanian desert, everyone on the plane is threatened with death if the English prime minister does not release an imprisoned hijacker. After turning off the plane, the captives endure blazing heat in the day, cold at night, extreme thirst and hunger, and the threat of the plane being blown up hanging over their heads for four days. I was excited to start this book which is based on the real experiences of the author but it fell fairly flat for me. A good indication of this is that it took me five days to get through it which is a ridiculously long time for a book of only 272 pages. I obviously wasn't captivated enough to pick it up often. Although it is counter-intuitive to say so, I felt like the story lacked enough tension. Perhaps that was on purpose as Anna talks about the boredom of being on the plane even as the terrorists strap explosives on. One brighter spot for me was the way in which Anna comes to understand why a couple of the Palestinians are taking this course of action. Moss does a good job of showing their rationale without making their actions sympathetic.